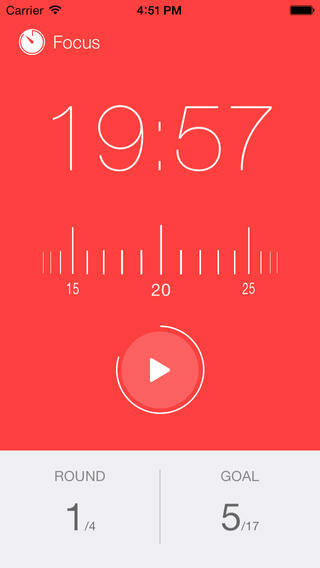 In the 1980s, a chap called Francesco Cirillo developed a new time-management technique called the Pomodoro. Cirillo wanted to get more out of his working day by remaining intensely focused on tasks for short bursts of time. This is why the Pomodoro technique divides work productivity into 25-minute bursts, with up to five minutes of rest in-between. 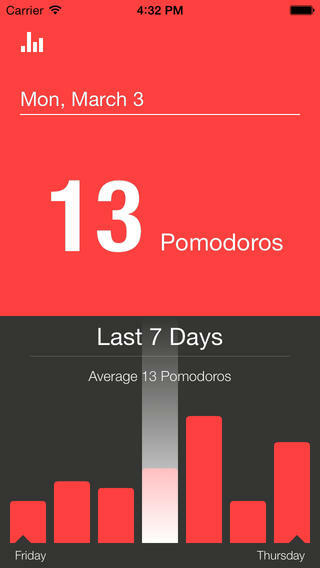 Designed to avoid burnout and mental fatigue, Pomodoro has proved successful for people in all manner of industries, hobbies and disciplines. And, in the digital age, we can rely on smartphone apps like Focus Keeper to ensure we keep our Pomodoro game in top shape. Open the app (available for just £1.99 from the iOS App Store), and you’re met with a striking red interface. This is a nod towards the tomato-shaped kitchen timers Cirillo used to market the technique (‘pomodoro’ is Italian for tomato). Limepresso tell us that Focuse Keeper is “a timer that will track and increase your productivity without burnout,” making it something more than a simple stopwatch app. 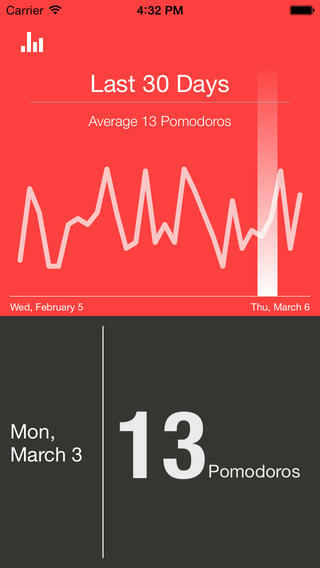 Users can set specific daily goals and rounds of productivity they wish to complete, but the app also generates charts that display your progress over 14 and 30 days. The app is very easy to pick up and use, which is essential for a tool designed to help rather than hinder productivity. People who are already familiar with the Pomodoro technique will find it particularly easy to jump into, but it should be noted that it doesn’t really offer much of an insight into the concept of this productivity method. New starters will therefore need to do a little bit of their own research in order to find out how to get the most out of the app. You can choose from pre-set timers of 25-minute work increments with five minute short breaks and 25-minute long breaks, but the app allows you to customise these yourself with a virtual on-screen dial. A neat feature enables users to set exactly how many work sets they wish to perform against a total daily goal – particularly handy if you’re already using the Pomodoro technique during your working day. Focus Keeper includes a ticking sound that’s turned on by default. Some users may find this comforting and helpful in terms of remaining focused, but if you find it irritating, you only need to head into the options menu to either mute it entirely or choose from alternative ticking sound effects. Equally, if you’re put off by the tomato-influenced red background that persists throughout the app, you can change the colour scheme, too. Focus Keeper is a pleasingly simple app and suits the iPhone’s touchscreen perfectly; the design is minimalist and does a fantastic job at avoiding becoming a distraction for users. It also continues to work whether you switch apps or put your iPhone to sleep, ensuring you never over step your Pomodoro time. At just £1.99, Focus Keeper is a bargain app for anyone looking to get into the Pomodoro technique. It would be nice to have some form of guide to the technique embedded within, perhaps in the future app updates, and there are plenty of Pomodoro resources online. If you’re struggling to get things done and fancy trying out this much relied upon form of productivity, we wholeheartedly recommend Focus Keeper.